Bundesliga | Leipzig head coach Ralph Hasenhüttl: "We really want to finish second!" 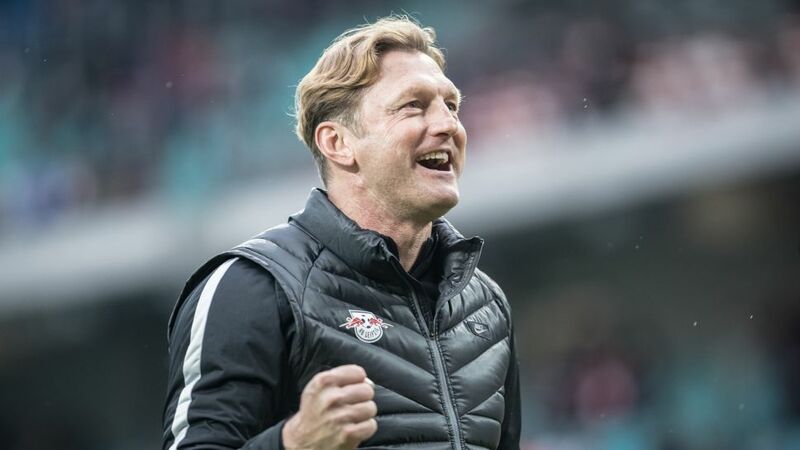 Leipzig coach Ralph Hasenhüttl: "We really want to finish second!" He is the mastermind behind RB Leipzig's storming debut Bundesliga season, but Ralph Hasenhüttl is not done yet. After steering the Bundesliga new boys into the group stage of next season's UEFA Champions League with room to spare, the 49-year-old Austrian strategist has the runners-up spot - and a potential Matchday 33 scalp against champions Bayern Munich - on his mind. bundesliga.com: After clinching a place in the group stage of the Champions League, will there be a party mood in front of your own fans on Saturday? Ralph Hasenhüttl: Definitely! We're going to have a proper do with the fans to celebrate our fantastic season, after the game. Obviously it'll be even better if we can put in a good performance against Bayern. We certainly want to do better than the reverse fixture, so we'll be very diligent with our preparations. bundesliga.com: Has qualifying directly for the Champions League satisfied your appetite, or is the runners-up spot still a big goal? Hasenhüttl: We absolutely want to finish second! To finish second behind Bayern would feel like a title win in itself because Bayern have been in a league of their own. "Best of the Rest" isn't a label we want to just give away after occupying second place for so long. bundesliga.com: From the Regionalliga Nordost to the Champions League in five years: should we be talking in terms of a football miracle is the success a logical progression? Hasenhüttl: Miracle is a term used to describe something unexpected. No one expected the club to make such accelerated progress, but it's also true that nothing has been left to chance here in recent years. Everything is down to everyone at the club giving their all and putting blood, sweat and tears into their work. That has made what we've now achieved possible. bundesliga.com: When did you first start to believe that the team could achieve something special in their debut Bundesliga season? Hasenhüttl: After the home win against Dortmund on Matchday 2, I saw that we – with our own playing style - were capable of beating the top sides. You could already see what the lads could achieve as long as we played with consistency. Looking back now on the first two games of the season and who we took four points off – namely Hoffenheim and Dortmund – you could see that we'd be right up there with them at the end of the season. bundesliga.com: What in particular is it about your team that has enabled this success story? Hasenhüttl: It might sound pretty dull, but our successes are a result of hard work on the pitch. In terms of running, we're one of the best in the Bundesliga. Our tempo, quick thinking and cognitive abilities – qualities all the players possess – have made it possible to put every team under pressure. And when we're in our groove and our game flows, we're not easy to stop.